When Six Flags Over Georgia opened in Atlanta in June 1967, it was truly unique for its region of the country. The theme park concept had, of course, been pioneered by Disneyland in Anaheim, California, but the Southern states were devoid of any such attractions. In fact, at the time of Six Flags' opening, Walt Disney World in Orlando, Florida, was just beginning the first stages of its construction. As most people know, Six Flags Over Georgia was originally designed in six themed sections, each of which would pay tribute to one of the nations that had controlled Georgia during the state's history... these being the United States, Spain, France, England, the Confederacy, and Georgia itself. Each area would feature at least one centerpiece attraction to lure visitors in its direction. In the Confederate section of the park, one of the big draws was to be a dark ride based upon the famed stories of Uncle Remus and Brer Rabbit, by Georgia author Joel Chandler Harris. 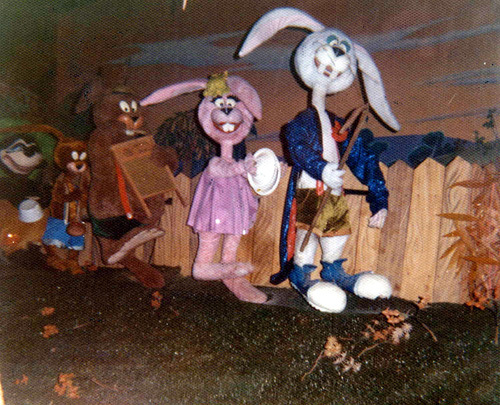 Perhaps because of copyright and/or trademark restrictions, as it turned out these character names were not used in connection with the ride, which was instead dubbed Tales of the Okefenokee and subtitled, "The Old Plantation legends." Joel Chandler Harris had specifically placed the setting of his stories in middle Georgia's Putnam County, but the adaptation of the Okefenokee Swamp for this purpose may have owed something to the marsh's popularity as the setting for Walt Kelly's famous newspaper comic strip Pogo. An artist's early rendering of an aerial view of Six Flags shows several elements of the park that never made it into reality. Judging by this painting, the Tales of the Okefenokee ride was originally supposed to be part of a complex recreation of a typical Southern plantation, complete with antebellum mansion. It appears that visitors were supposed to enter the queue area through a replica of Uncle Remus's cabin. This idea was obviously abandoned, and the ride was placed in a more ordinary-looking building adorned with signs and wooden cutouts of the animal characters. In a somewhat unusual move, for its first year of operation Tales of the Okefenokee was presented in a form that was totally different from the rest of its run. Six Flags had several art directors on board during its formative stages, including motion picture artist Hans Peters, but the person actually responsible for the ride's first incarnation is unknown. The few surviving photos from that first 1967 season present a strange vision indeed. The original animated figures that populated the ride were quite small. In fact, when compared with human beings, they appear to have been about the size of department store window animation. Only fragmentary evidence exists to indicate the types of scenes riders encountered in the first Okefenokee's depths. One photo shows a group of young rabbits proceeding in a row toward the primitive versions of Brer Fox and Brer Bear; a pencil sketch of Six Flags attractions, created for pre-opening publicity, depicts visitors gazing at Brer Rabbit and the famous Tar Baby. An early Six Flags souvenir cup features a tiny drawing of Brer Bear walking past a tree, behind which Brer Rabbit is lurking with a baseball bat, ready to club his adversary into senselessness. These tantalizing tidbits are seemingly all that remain of the ride's original concept. For reasons unknown, between the 1967 and 1968 operating seasons, Six Flags opted to have the entire ride redesigned. For this, they brought in famed puppeteers Sid and Marty Krofft, who were already hard at work producing elaborate shows for the park and its sister attraction, Six Flags Over Texas. At this time, the Krofft brothers were already well known for their tremendous puppet work, but their huge success with such children's TV programs as H. R. Pufnstuf, Lidsville, and Sigmund and the Sea Monsters was still in the future. 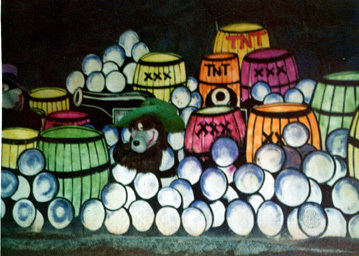 The Kroffts got down to business and completely redesigned the ride's scenes, keeping, however, the huge painted murals that made up the backdrops for the settings. The new animated figures were much larger than life, and were designed in a more "cartoony" fashion. In fact, the Kroffts' version of Tales of the Okefenokee seems to have been patterned quite heavily after Walt Disney's treatment of the Uncle Remus stories as created for the movie Song of the South and its related storybooks. One difference is that, as mentioned earlier, the characters of Brer Rabbit, Brer Fox, and their swampland cohabitants were renamed Mr. Rabbit, Mr. Fox, etc. The Kroffts recorded a whole new set of voice and music tracks to help their animated figures come to life. The music was obviously composed and recorded on a fairly substantial budget, but the sound effects often sounded humorously homemade. However, it was their version of the ride that continued to operate for another twelve years and became familiar to all of Six Flags' visitors during that period of time. Upon taking our seats in the Fiberglas boat, designed to look like an Indian craft made of skins, we shove off. 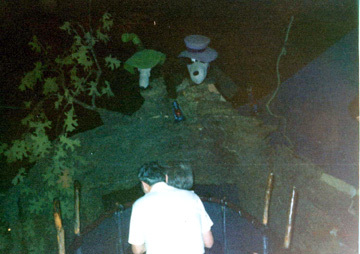 Looming ahead is the dark entrance to the ride, flanked by wooden rabbits holding signs cautioning us to "Keep hands inside the boat" and "Do not feed the bunnies." Welcome, neighbor, welcome, you shorely made our day! Shore glad you did, so let's git on our way! Having received this royal welcome, we float past the swamp's fishin' hole, obviously located in the ruins of a former plantation home. 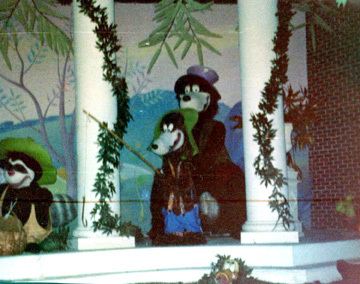 (Knowing that the Kroffts were utilizing the backdrops and scenery that already existed, it may be that the original version of the ride opened with a pseudo-plantation diorama.) Mr. Rabbit, Mr. Fox, and Mr. Bear are all fishing with gigantic hooks and worms, while a bullfrog works on his suntan and a raccoon fumbles with the picnic basket. In one corner, a turtle rocks himself to sleep on the back of his shell, snoring lustily. Now we enter a cave and are unable to see what lies ahead, except the giant green snake that is peering down at us. We round another bend and suddenly the vista opens up. The "critters" have formed a gadget band, with old Mr. Rabbit leading the way. A pink female rabbit is clanging pot lids together as if they were cymbals, while a chubby boy rabbit wearing a beanie plays the washboard. The raccoon beats an inverted pot and another rabbit somehow manages to make music by blowing on a toilet plunger like a trumpet. Bringing up the rear, the turtle toots on a jug while yet another rabbit pounds his shell like a bass drum. Across the river from all this gaiety, a garden of lively animated carrots with the faces of women sing out over and over again, "Save the rabbit! Save the rabbit! Whatever you do / Or else he's gonna wind up in a kettle of stew!" What are they talking about? We soon find out, because we find those two miscreants, Mr. Fox and Mr. Bear, stationed in front of the bruin's ramshackle house. The fox is chuckling demonically as the bear clutches a giant burlap sack; the head of the unfortunate Mr. Rabbit is popping up and down inside the bag! Adding to the drama of the moment is a chicken trapped inside Mr. Bear's shack. The panicky poultry keeps sticking its head out the window to scream distractedly for help. We do not get to see how this crisis is resolved, because our boat floats on past some more of Mr. Bear's crops, but soon we reach another grotto in the swamp. It appears that Mr. Rabbit has been rescued by the friendly owls, who are circling overhead carrying a white bed sheet that, from below, might give the impression of being a ghost. The fox and bear are plainly terrified, and are cringing at the very sight of the apparition. More trees and colorful foliage interrupt our view, then we approach another clearing. The entire rabbit family is having a field day! Two of the little boy rabbits have rigged up a puppet show, with marionettes that are unflattering caricatures of Mr. Fox and Mr. Bear. (This may have been an inside joke by the Krofft brothers.) The rest of the clan is engaged in helping their pa, who has cornered a cow and is milking her for all she is worth. Those creatures up ahead there are liable to scorn ya. I'd turn around and go back, that's if I wuz you!! Much as it might benefit us to heed their advice, there isn't much we can do about the constant forward motion of our boat, and a huge, forbidding cave looms in our path. The speed of the boat slows considerably as we drift into the cave, and a chilly wind blows on our faces. Horrors! We have stumbled upon the secret arsenal of Mr. Fox and Mr. Bear! In this cave, glowing under ultraviolet "black light," are enough cannons and cannonballs, gunpowder and TNT to blow up the whole swamp. To endanger our lives even more, the diabolical duo is blazing away at our boat with their rifles! We escape with our lives... barely, it seems... but only to face even greater peril. Emerging from the cave, we find that everything has become pitch dark, save for a reddish glow coming from around the next bend. After negotiating the curve, we are confronted by an enormous tree that has fallen across the water, forming a sort of natural archway. On top of the fallen tree, the fox and bear have somehow gotten ahead of us and are swinging red railroad-style lanterns. The whole scene is horrific, and it doesn't help matters any that the pair is ominously chanting, "BEWARE! BEWARE!! GO BACK!! GO BACK!!" What is this? Our boat is being pulled up some sort of incline, higher and higher, until it looks like we are going to run right into the two lantern-swinging malefactors! But at the last moment, the boat reaches the summit of the incline and abruptly plunges down the opposite side with a sickening splash. Now things are even worse than before. The entire swamp has been engulfed in a thunderstorm of major proportions, and frightening sights appear everywhere. A huge tree with an evil face suddenly lurches forward as if to fall onto our watercraft. Owls with lighted eyes stare from every tree, and an equal number of huge rattlesnakes hang uncomfortably close to us from the branches. The wind is blowing at gale force as blacklighted bats circle in the air, and on the ground fearsome-looking alligators snap their vicious jaws. Lightning flashes illuminate the nightmarish scene, but how do we get out of all of this?! Suddenly we spy something ahead. Is it?.... Yes, it is! The fearsome briar patch! Its huge thorns indeed appear threatening, but everyone knows the briar patch is the home of none other than Mr. Rabbit, and sure enough we float through an opening in the hillside and find ourselves in the safe refuge of the rabbit family's underground burrow. Outside the hares' burrow, the storm has passed and the sky is clear and moonlit. And where are Mr. Fox and Mr. Bear? Well, the two chastised meanies have wound up sitting soggily in the mill pond, and are covered head to toe with croaking frogs. They both look somewhat bemused by it all. In the next clearing we find the grand finale of our hazardous trip. It looks like Mr. Rabbit has finally fixed Mr. Fox and Mr. Bear for a good long while; he is using a long pole to shake a large hornets' nest, and the angry swarm is chasing the fear-crazed criminals into the distance.On the other side of the stream is a scene of celebration. The rabbit children and their friends are having a carnival: one of the little bunnies floats in the air, suspended from a giant bunch of colorful helium balloons... a rabbit and the turtle play on the seesaw... the raccoon balances small rabbits on his shoulders... jugglers and magicians entertain... even the crow quartet is on hand! Visible is a plant that is obviously indigenous to only the true Deep South: a watermelon tree, and even some of the watermelons have come to life and sprouted eyes and mouths. The air is filled with music as the swamp denizens sing out their "national anthem:"
It don't ever hurry 'cause it ain't got no worries. Take her advice and you'll never go wrong. You won't ever forget it and you'll never regret it. Once you have tried it, you'll holler fer more! She's a big, big mama, and she looks after all. If you're one of her children you're gonna have yoursef a ball! You'll be in paradise before very long! Overhead, a jolly sun laughs with glee at the sight of the fun below (and, one suspects, the discomfiture of the fox and bear). Our last sight in the swamp is Miz Rabbit, who waves to us from the shore and coos, "Bye now... y'all hurry back, ya hear?" The boat enters a final cave, the walls of which are studded with multicolored diamonds, and before we know it we are back in the "real world." It's been an amazing journey. Well, everything might have ended happily for the animal residents of the Okefenokee, but unfortunately the creative ride did not have such a happy ending in its own future. By the close of the 1980 operating season, Tales of the Okefenokee was in a deteriorating condition, and it was getting worse all the time. Twelve years of repeating the same simple motions over and over had stripped the gears and worn out the machinery that powered most of the animated figures. Even as early as 1975, almost half of the singing carrots ("Save the rabbit!") had been removed and the resulting empty spots filled with extra shrubbery. Maintaining the ride was causing problems for the staff. The humidity inside the building was wreaking all sorts of havoc: the huge background murals were suffering, and the characters' clothes and fake fur wore out at an alarming rate. Besides that, it was not only the wear and tear that gave the Six Flags employees headaches. The audio department for the whole park was located in the rear part of the Okefenokee building... in fact, just on the other side of the wall was the Christmas scene. The employees of the audio department were driven half mad by the constant repetition of the rabbits' Christmas song over and over again all day long, so quite often they would simply turn off that particular soundtrack and leave the Yuletide scene as a true silent night! Vandalism proved to be another constant problem. The slow-moving boats made an ideal situation for zealous pranksters, who delighted in jumping onto the shore, performing some sort of devilment, and then catching up with their boat downstream. 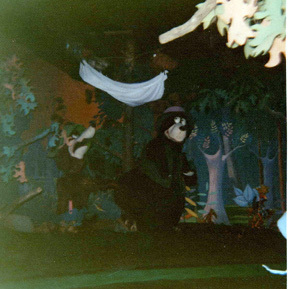 Employees report that the characters' hats were the most pilfered items, but at least once some enterprising hoodlum managed to cut the marionettes' strings in the puppet show scene and make off with the faux Mr. Bear figure! Eventually this problem was partially solved by digging a trench alongside the trough and allowing it to fill up with overflow water, thus giving a sort of barrier between the boat riders and the figures on the shore. Outside troublemakers were one thing, but it was the troublesome singing carrots themselves that nearly caused the whole ride to go up in flames during its last year of operation. The interior mechanism inside one of the vegetables became stuck, making its interior coil become hotter and hotter. The carrots were molded out of polyurethane foam, so when the damaged one caught fire, the conflagration spread quickly. Before the fire had been extinguished, it had destroyed the carrots' backdrop and even spread to the fox and bear who had caught Mr. Rabbit in a bag; these figures had to be massively refurbished. The carrots were a total loss, but there had to be something in their spot to take up the chorus of "Save the rabbit!" The best solution anyone could come up with was to take the four singing watermelons from the end of the ride and put them in the carrots' place. This admittedly looked a bit strange, as the four watermelons did not even begin to take up the space that had been occupied by the dozen or so carrots, but that was the way it went. Not surprisingly, at this point Six Flags decided that Tales of the Okefenokee had overstayed its welcome. The well-known Larc amusement ride design ompany was employed to create a new interior for the ride, which henceforth was to be known as The Monster Plantation. The only part of the ride that would remain untouched was the trough in which the boats traveled.Conversion of the Okefenokee Swamp into the Monster Plantation began the day after the park closed for the year, and it was done without mercy. A work crew was sent in to remove all the characters and scenery that had comprised Tales of the Okefenokee. They accomplished this by literally ripping the various rabbits, foxes, bears, and their companions loose from their floor anchors, usually destroying the character in question at the same time. These pieces were all tossed into a truck and unceremoniously hauled away to a dump. The scenery was disposed of in the same fashion, although a theatrical supply company did purchase the background murals for renovation and possible use in local stage productions. There was only one attempt to save part of the swamp, and even it was ill-fated. Someone thought there might be a future use for the enormous neon lightning bolt that flashed during the storm sequence, but the workmen, who were not inclined to be gentle, smashed the light while they were removing it from the wall. So much for the Okefenokee storm. All of this mayhem having been perpetrated with a vengeance, the work crew then added even more injury to these existing insults. A bulldozer was driven right into the building and razed anything that might possibly have escaped thus far. When the dismantling was finished, everything had been leveled all the way down to the building's concrete floor, with only the trough to give any idea of its former life. One part of the Okefenokee's construction that was left untouched... more out of necessity than any other reason... was the "lift" that had carried patrons past the fox and bear and their lanterns and into the raging storm section of the ride. This lift served a practical purpose, in that it camouflaged the spot at which the ride's circulating water was both fed into and drained out of the trough. The pond in which Mr. Fox and Mr. Bear had been nonplused by the frogs also remained, as it was built into the floor. The Monster Plantation had to be completed in record time in order to open with the beginning of Six Flags' season in the spring of 1981, but the workmen made the deadline. Before long, there were few people left who remembered that the boat ride had originally been a tribute to both Joel Chandler Harris and the Okefenokee Swamp. The voice and music tracks of Tales of the Okefenokee were stuck into a filing cabinet and forgotten until they were trashed around 1987. The few animal characters that had escaped the demolition process were themselves scrapped in 1985. The park's administrative offices discarded everything they had on hand that had been connected with the Okefenokee ride. All that was left were memories. And even those quickly faded. Bye now. Y'all hurry back, ya hear? It must be admitted that a few longtime Six Flags employees raised an eyebrow or two when the Walt Disney Company first unveiled its Splash Mountain water ride in 1989. 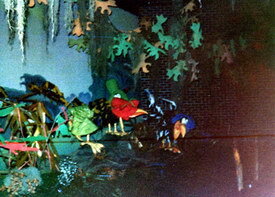 Although the main focus of Splash Mountain was its climaxing flume, the animated dioramas depicting scenes from the Uncle Remus stories certainly bore more than just a passing resemblance to what Six Flags had thrown away a decade earlier. We may never know whether some Imagineer originally hailed from Atlanta, but the family connection is there nevertheless. This article Tim Hollis and used with permission. Photos Tim Hollis, and used with permission.